EliteFlyers.com reveals version 5.0 of their website this month, including an impressive list of added features and capabilities. The site overhaul includes user-friendly additions like online design tools, easy-to-use templates, and graphic design resources. 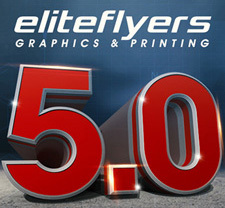 Since their establishment in 2004, EliteFlyers.com has expanded and evolved to meet the ever-growing demands of “web2print” customers across the globe. The new EliteFlyers.com is overflowing with easy-to-use design tools to help even the design novice create beautiful marketing materials efficiently and on a budget. At EliteFlyers, customers will now enjoy a full-fledged “web2print” experience. Version 5.0 provides a more streamlined shopping experience including more automation for easier and quicker ordering, enhanced order status and tracking, and online proofing. Customers will also notice a more robust product selection and more options within products—think sizes, cuts, finishes, and specialty additions. Another new tool allows customers to easily generate and include a custom QR code within their design. The pinnacle of the redo, though, is the ability to fully design products on EliteFlyers.com. Customers can utilize an array of beautifully designed templates to create business cards, flyers, posters, and more. Design tools and graphic design resources have also been added for customers that might find the process a bit daunting. If the process still feels overwhelming, EliteFlyers.com provides around-the-clock customer service—something they’re well known for. The new site is already live, and customers can check the EliteFlyers.com homepage for the latest sales and specials.